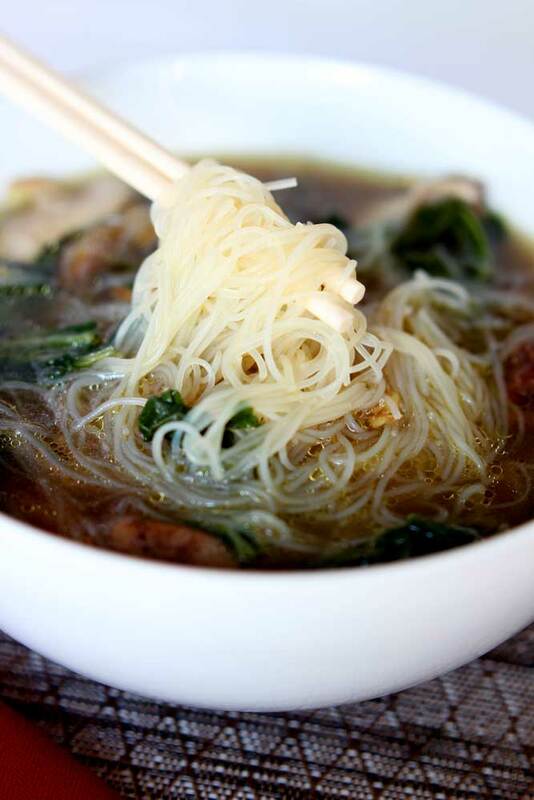 This Asian Chicken Noodle Soup has an amazing authentic taste! The chicken marinated in Chinese Five Spice makes it amazingly tender…it melts in your mouth! 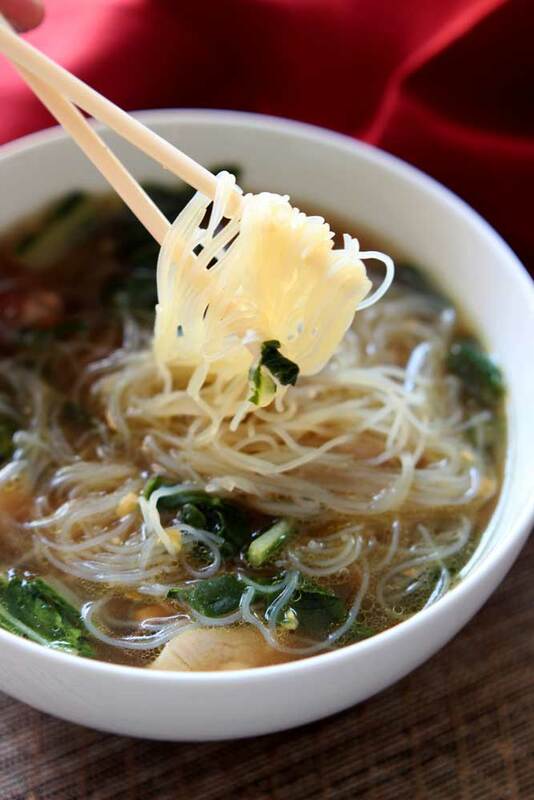 The gluten free Mei Fun in this savory soup paired with the fresh ginger and garlic makes this dish over the top! 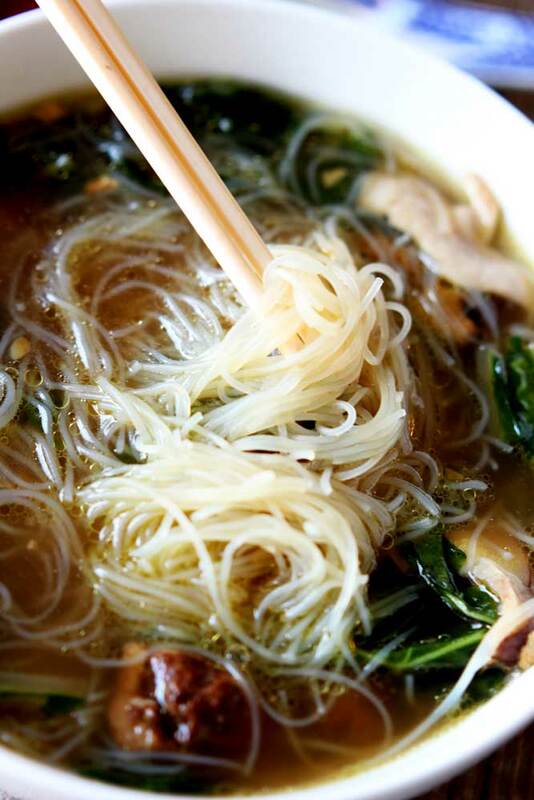 Nothing screams savory like homemade chicken noodle soup…especially with an Asian flair!! I am SO happy to post this recipe! This one is really special to me! So let me tell you why….this recipe comes from my sweet friend Jessica Miller. Jessica and I were college friends 17 years ago. When I moved out west, I lost touch with some of my friends but thank God for Facebook! After 17 years, I found her! It turns out, Jessica is in culinary school! I’m super proud of her for making this venture and Pursuing God’s will for her life! Jessica graciously shared her recipe and I made it last weekend. Oh my goodness…it’s amazing! Like so amazingly good! And…it’s gluten free!! Ok, let me share some of this yumminess with you! The first thing you will want to do is buy 1 pack of boneless and skinless chicken thighs. You’ll want to marinate the chicken for 24 hours in Chinese Five Spice. Ok, so I didn’t have this in my spice cabinet and my local grocery didn’t have it either (which is odd) so I ordered it from Amazon. You can order this spice here from Amazon . Ok back to this soup…don’t skip the marinating the chicken part! The seasoning of the chicken is what gives this soup that asian pop! And that protein kick is what you want! And let’s talk about noodles for a minute. You heard me mention that this soup is gluten free, right? I am so thrilled it’s gluten free! Jessica suggested I use Mei Fun rice noodles. I bought these on Amazon, as well. Look at those noodles! They worked so perfectly in this recipe! A lot of rice noodles I’ve used in the past fall apart so easily in pasta dishes and soups, but Jessica told me these would hold amazingly well in the soup and they did! This soup lasted us all week and my 9 year old even took it to school for her lunch 2 days in a row – that’s how good it is! I’m so super proud of my friend Jessica for pursuing her culinary dream. You are doing an AMAZING job and I love that you shared this recipe with me! Keep sending them my way and I’ll keep sharing the culinary love! This Asian Chicken Noodle Soup is definately worth repeating and so many people are going to love this recipe! Happy Eats! Note: This post is not sponsored, but you will find affiliate links on this page. The price you pay as a consumer does not change, but I may make a small commission based on your purchase! Thank you for supporting Recipes Worth Repeating! 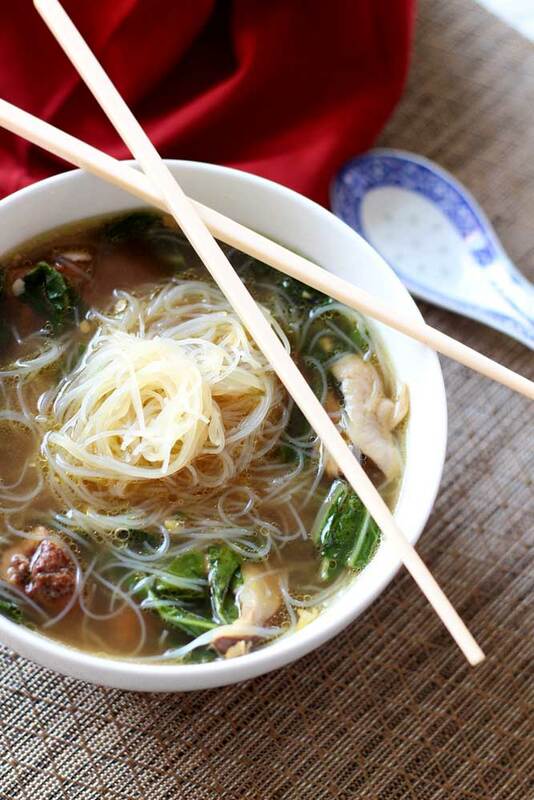 This Asian Chicken Noodle Soup has an amazing authentic taste! The chicken marinated in five key spices makes it amazingly tender...it melts in your mouth! 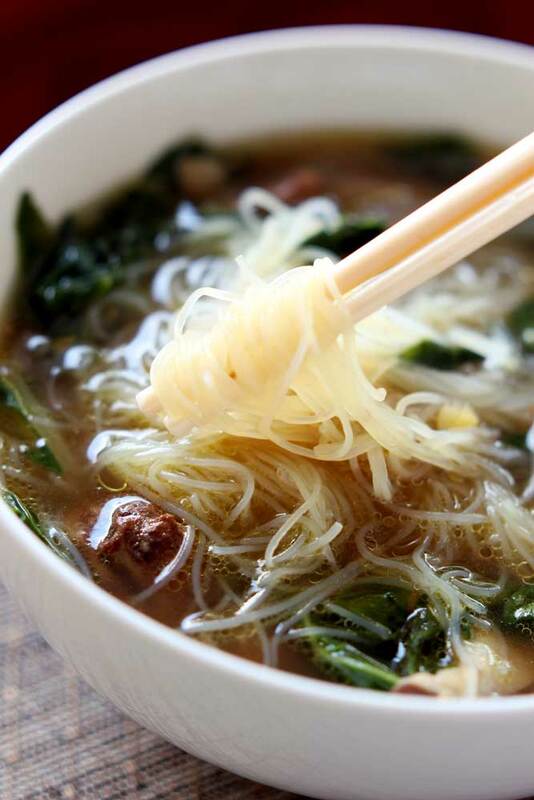 The Mei Fun in this savory soup paired with the fresh ginger and garlic makes this dish over the top! 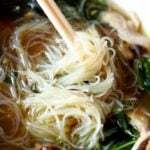 Nothing screams savory like homemade chicken noodle soup...especially with an Asian flair!! I a large glass dish, marinate the chicken thighs using a 1/2 Tablespoon Extra Virgin Olive Oil, Chinese Five Spice Powder, salt, black pepper and red pepper flakes for at least 24 hours. After the chicken has marinated, warm a stock pot with 2 Tablespoons of Extra Virgin Olive Oil over medium high heat. Sear the chicken thighs in small batches for about 5 minutes. (Only sear the chicken, you do not want to cook it all the way through at this point). Remove seared chicken from the heat and set aside on a plate to cool. Keep the oil and chicken drippings in the pot and reduce heat to medium. Add in the ginger and garlic, allow to cook for about 1-2 minutes. Add in the mushrooms and stir thoroughly. Add in the soy sauce, chicken broth and water. After adding in liquid, cut the chicken in bite sized pieces and add into liquid. Reduce heat to medium low and allow to cook for about 20 mins. While the soup is cooking, cut the Bok Choy by removing the base and dice all of the remaining green leafs. (You want your Bok Choy cut chunky). Soak the Bok Choy in cold water to thoroughly remove all dirt, about 20 minutes. After the 20 minutes have passed, drain the Bok Choy and rinse one more time and then add into soup to allow to cook. Prepare the Mei Fun by soaking in hot water for 10 minutes which is the perfect amount of time for the Bok Choy to finish cooking in your soup. When the Mei Fun is done, drain Mei Fun and add into soup. Top this soup off with chopped green onions. 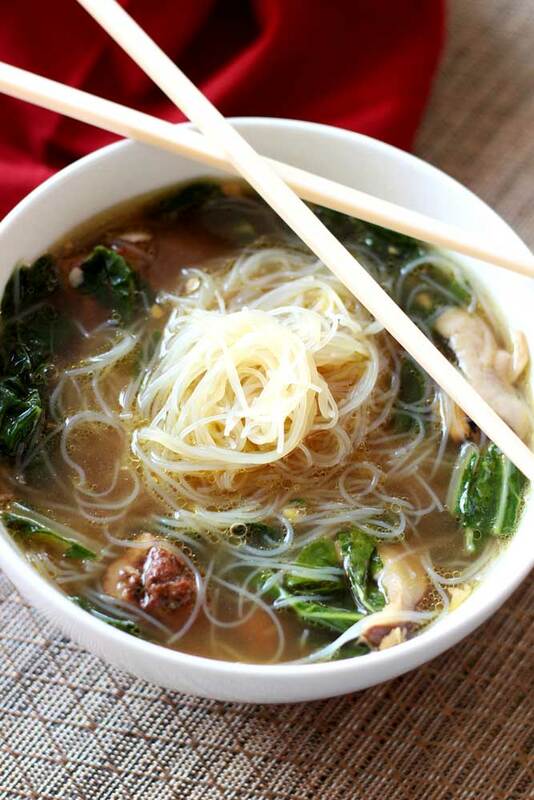 Pin this to your favorite Soup or Asian Food board! This soup looks so flavorful! Is there any way the marinade can be shortened? How about 12 hrs.? Want to make it NOW, it looks fantastic! Thanks. Could u reply asap, as I have it started! Yes, you can shorten the marinate time…just remember that the longer the marination the more robust the flavor! Let me know how it turns out!! Hey Amanda, I’m prepping for this recipe now. However, i can’t find any size specifications for Chicken to marinade . Leave them whole & shred later or cut up first ?? Also, no specifics on the mushrooms. I’m a veteran home cook who usually reads well between the lines but Asian is somewhat new territory. Seems like this is quite popular. Looking forward to having some soup this week. Hi KJ! Sure! Happy to help! You want to marinate the chicken thighs whole. Don’t cut them into pieces until step 8. In regard to the mushrooms, I talk about that in step 7. Let me know if that helps or if you have any other questions! Thanks Amanda, sorry I missed the chicken cut up in step 8. Are you leaving the mushrooms whole or slicing them ? And I’m also assuming that you’re not using the white part of the bok choy at all? Thanks Amanda, however, I’m still not sure whether you’re leaving the mushrooms whole, or what ? Slice the mushrooms. I use Portobello, but baby bella are fine too. Hi there, made this last night and it was delicious. I was wondering have you ever tried this recipe with shrimp? Thanks for letting me know you loved it!! No, I’ve not made it with shrimp but I bet it would be delish!! If I were to use shrimp, I’d do it the exact same way I list in the directions, except use shrimp instead of chicken. I bet it would taste amazing!!! Let me know if you try it with shrimp! Love this authentic dish! I can’t wait to make it. If you don’t do spicy, leave out the red pepper flakes. 1/2 tsp does provide a little bit of a kick so I’d just leave them out! I am always looking for a delicious ethnic dish and this one sounds fantastic. Pinning this for later!